A morning wedding with bouts of beauty that are sure to make you wish you were a part of it. Held in the grand space at Fairmont, Jaipur, Rohan and Nishita’s wedding was one-of-a-kind beautiful while still keeping with tradition. Dressed in a classic Shyamal and Bhumika design, this bride looked stunning. The zardozi embroidered lehenga with its regal flare, along with her jadau and temple jewellery layered exquisitely, Nishita was a vision to behold! Rohan too made an uber dapper groom in his intricately weaved wedding sherwani made in a combination of gold and white. Their wedding mandap was decorated exclusively with marigold flowers and kaliras with delicate floral hangings in a mesh styled pattern. The use of domestic marigolds and other decorative hanging were perfect for their traditional morning wedding affair.This extravagant celebration of Nishita and Rohan held at Fairmont Hotel, Jaipur is sure to give you all the destination wedding goals. Right from the pre-wedding shoot to the wedding itself, their wedding was all kinds of legendry! 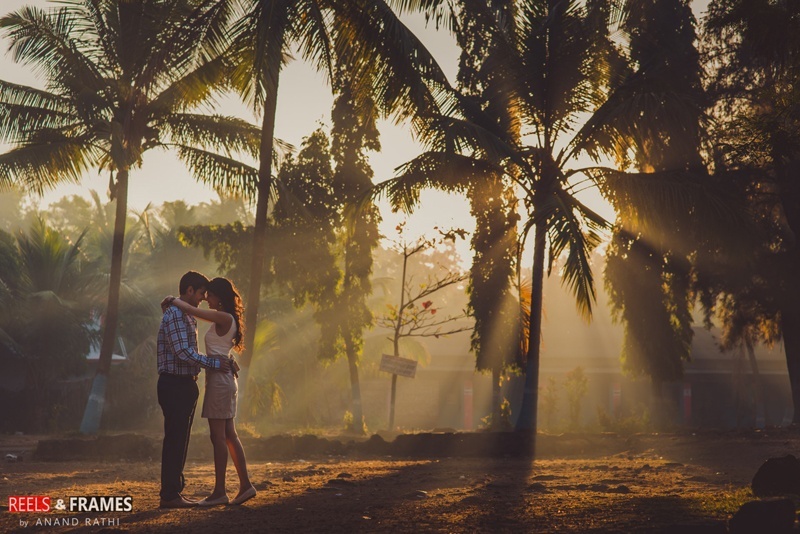 Rustic, countryside spaces with old abandoned homes, worn down forts and virgin beach fronts – Reels and Frames went au naturale for Nishita and Rohan’s pre-wedding shoot. The simple backgrounds and unrefined spaces were a perfect setting to showcase this gorgeous couple’s young, raw love. Nishita and Rahul kept it classic with their outfits to complement the environment too. We were completely swooning over Nishita’s bubblegum pink midi-skirt and Rahul’s vintage hat and blue bowtie combo. Rohan and Nishita’s traditional Indian wedding function definitely wasn’t complete without a Haldi ceremony, and a fun one at that! With play-fights and the sweetest moments shared between Nishita and her brother, Saahil this one was all about the love. The yellow hue of haldi is said to be auspicious and a natural beauty secret better than any international beauty brand, your grandma will definitely agree – hence both Rohan and Nishita’s family made sure to drench them in this paste completely. This Pinterest worthy mehndi ceremony will give you all the goals for a colorful mehndi ceremony. The floral printed table covers, watering can centerpieces and the extravagant blue tricycle fully covered in green creepers and fresh green ferns. They also had a chai vendor on a bicycle covered with parande, shimmery green décor strings along with a Jaipuri umbrella – which looked so Bollywood. Rohan and Nishita too were the embodiment of style dressed in uber chic yet desi outfits, with Rohan in a powder blue Jodhpuri suit and Nishita sparkling in a mirrorwork kurta and sharara. What especially caught our attention at this vibrant outdoor mehndi was the gold hued headwear with crystals given out as favors. Tea-lights, vintage lanterns and bright yellow flowers – could this wedding get any prettier? With every passing wedding ceremony, the décor, outfits and the love only seems to level up. Rohan and Nishita’s Sangeet was a classy affair with the right elements of desi brought in by the power-packed dances, while the fire-breathing artists brought on the heat at this classy affair (pun intended). The soon-to-be-bride too danced effortlessly in her bright pink shimmery lehenga, paired with bold polki jewellery that had us completely mesmerized! Check out more photos from this Real Wedding here.